Representative of the Lloyd Bros company of Toledo, monument manufactures arrived in Wapakoneta Friday to look after the preliminary work preparatory to the erection of a monument in Greenlawn cemetery that will be the largest all polished monument in the world, gave a similar monument in Woodlawn cemetery at Toledo, of which this one will be a counterpart. The magnificent creation of the hand of man will mark the last resting place of the remains of the late Charles F. Herbst Sr.
G. W. Gale will have charge of the work for Lloyd Bros., and will be assisted by William Fry and A. C. Stantz, with the addition of the necessary number of local laborers to complete the gigantic task. 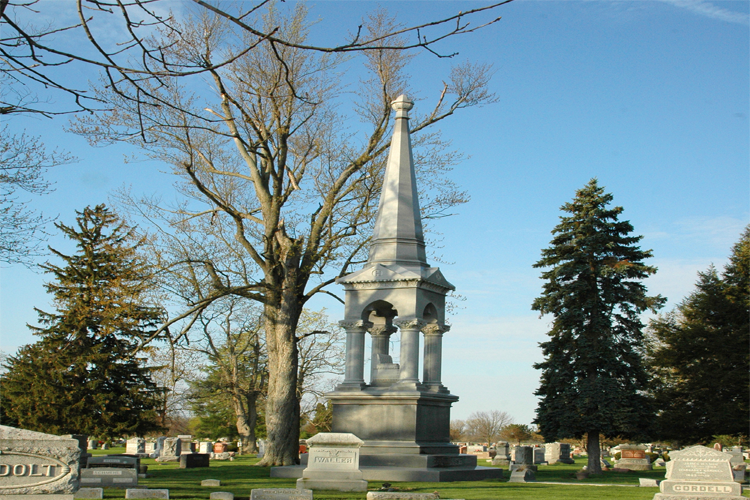 The monument complete will weigh 160 tons, and is an exact duplicate of monument in Woodlawn cemetery at Toledo, the largest all polished monument in the world. Two car loads of tools and hoisting devices was expected to reach Wapakoneta Friday night over the C. H. and D. to be hauled to the cemetery when the work of getting ready for the big task will start at once. The monument parts are now en route to Wapakoneta from Barre, Vermont, where the work was done, and requires four cars. One of the cars is specially designed for the transportation of mammoth monuments. The foundation was made ready for this monument last fall. It is of concrete, fourteen feet square, and is eight feed deep, requiring more than a car load of material. 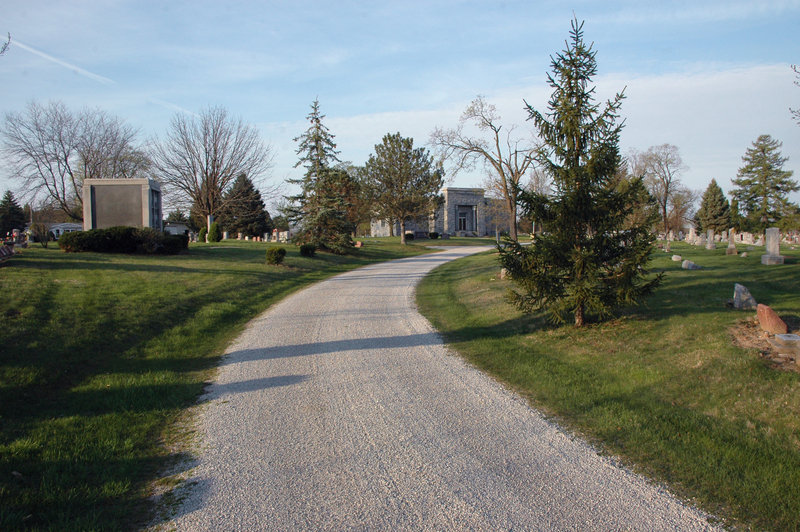 The cars carrying the monument parts will be transferred from the C., H., and D. to the Western Ohio upon their arrival here, and will be taken into the cemetery over a specially laid track at the cemetery entrance. The arch over the entrance will be removed and the track will be laid in the driveway. The site of teh monument is about fifty feet from the driveway where the track will be laid, and it will be necessary to move a monument and a marker over other graves temporarily while the monster blocks of granite are being moved to their location. When completed, the beautiful monument which will stand in honor of the memory of a departed Wapakonetan, will have a complete height of 59 feet. There will be three bases, surmounted by a die, on which is to be placed four columns, supporting a canopy, on which will be erected a shaft or spire, surmounted by an urn. Under the canopy will be placed a chair chiseled out of granite and which has the appearance of being finely upholstered. The entire monument is of Barre granite, of light hue, and will make a most imposing appearance. The bottom base has a wight of 30 tons and the die 20 tons. There are other monuments in the world as large as this one will be, but none save one in Toledo of its size that is all polished save the chair and the place for inscription on the base. Special permission was obtained from the County Commissioners for the construction of a temporary track across the road from the Western Ohio main line at the cemetery entrance, and permission has also been granted by the Cemetery Trustees for laying of the temporary track along one of the main driveways to reach a point near the monument site.